Or, how the farming communities have changed their models to reflect their customers’ desires. It used to be the case that Community Supported Agriculture (CSA) programs used one or two farms that pre-sold their crops. Buy in before the season started and reap the bounty of what was grown. Not much in the way of options, and very risky in bad weather years. These days, things have changed. The models keep evolving. There are cooperatives. Home deliveries. Buying services. All sorts of sizes, add ons, payment plans and expansion of the definition of local. Here in Howard County we have many choices in the winter. 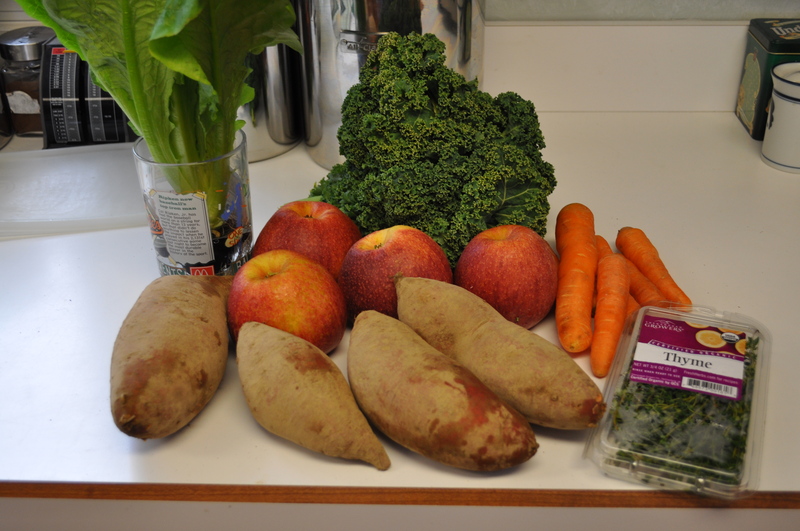 For us, finally, we got our winter CSA from Lancaster Farm Fresh Cooperative. The Coop has over 100 farmers in it now. And, they have expanded their options, offering packages and add ons. Today was our first pick up. What do you get in the winter? All of us who bought vegetable shares got these in our box. 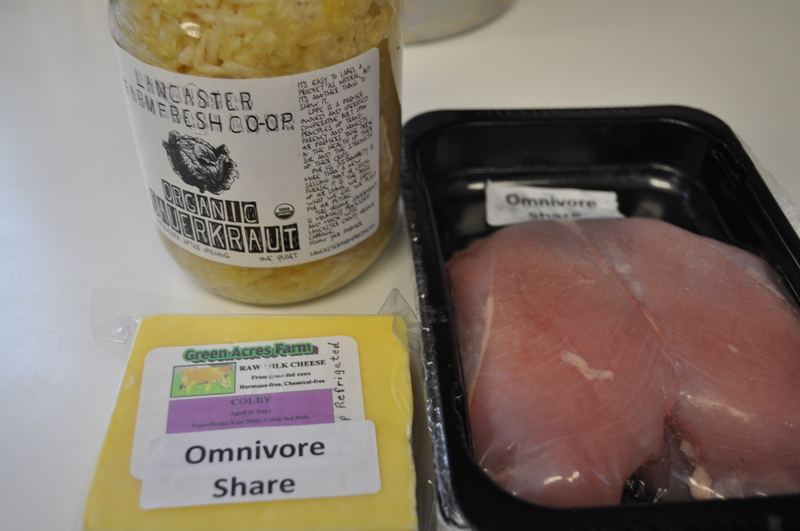 Some of us chose an omnivore package, with three add ons. Others may have chosen a Vegan package, which had tofu instead of chicken. They got bread, instead of cheese. Sauerkraut. Colby. Chicken breasts. 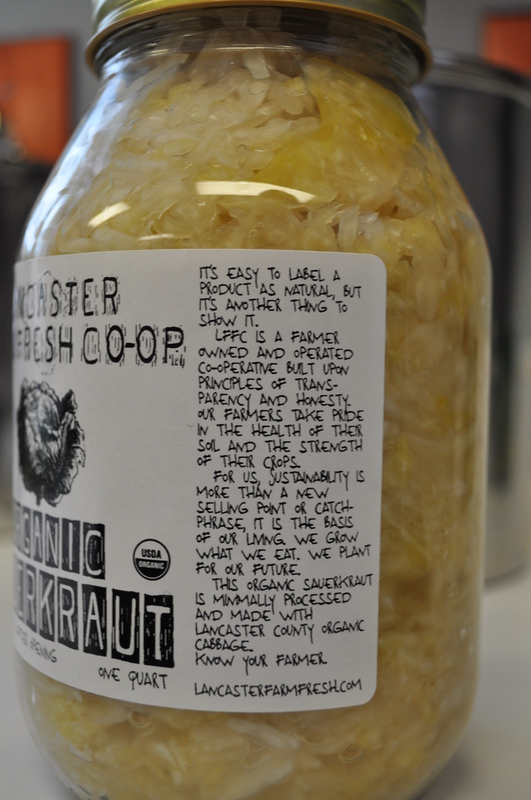 I love the message on the sauerkraut. As for the other half of our winter food source, we still love Friends and Farms. Today is our one year anniversary of buying from them. What is interesting today? The carrots in our Friends and Farms basket come from Lancaster Farm Fresh Wholesale. 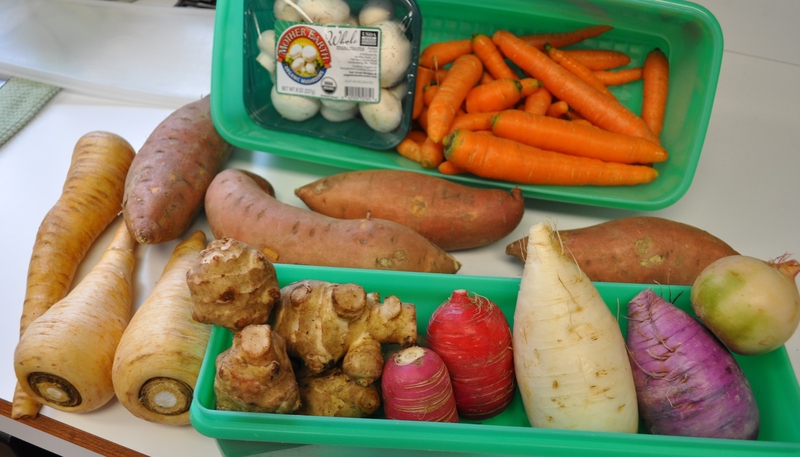 Many of the produce items come from the same cooperative that supplies our CSA. As I said above, the evolution in provision of fresh local and seasonal foods has brought us many good choices. There is definitely a program and a package that fits a person or a couple or a family, a package that replaces mass market grocery store food. Today, our small basket from Friends and Farms included the following. This was in our insulated bag. Individual Quick Frozen (IQF) green beans. Chuck roast. Eggs. Chevre. Cod. Ground beef. The ground beef was our chosen substitute for bread. The eggs. Our substitute for milk. What I love most about them is their flexibility to tailor your basket to your preferences. 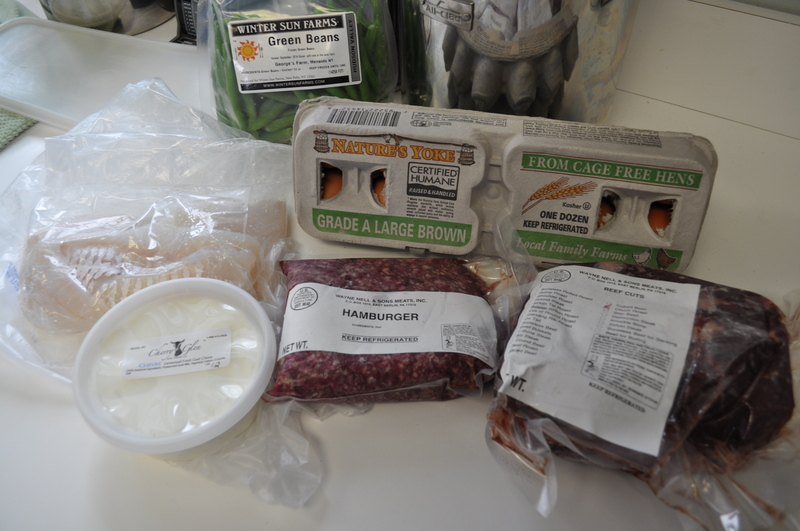 For us, all the protein we need for a week comes in this basket, and in our CSA. The rest of our vegetables? Sweet potatoes. Carrots. Thyme. Apples. Hydroponic romaine. Kale. There are other winter options for food around here. Zahradka Farm delivers weekly. So does South Mountain Creamery. They both let you tailor your deliveries to include your preferences. This is so different from the days of rigid “Take it or leave it” CSAs. Come March, add the early bird Breezy Willow to the choices. We really are lucky. We can have fresh regional foods (mostly from a 150 mile radius). You can’t beat fresh produce. Way better than those cardboard tomatoes in the stores. 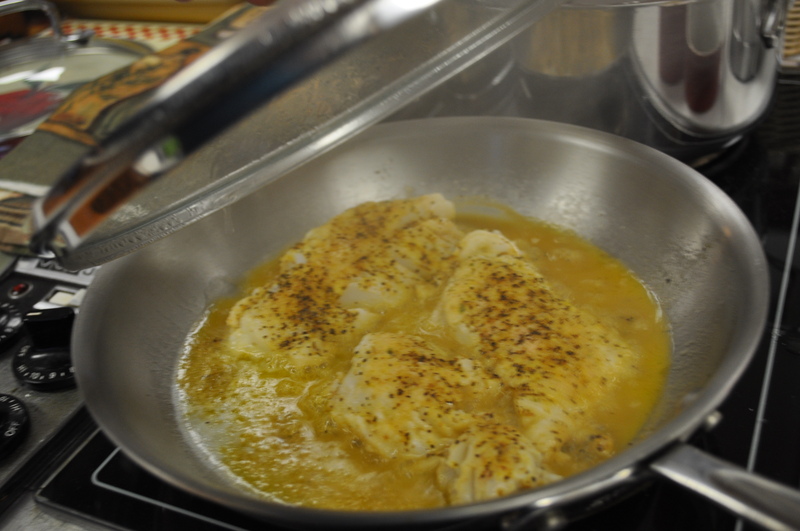 I pan fried one of those cod fillets in some browned butter. Seasoned with bread crumbs and paprika. Served with those IQF green beans and a sweet potato. Posted in CSA, Farms, Food, Friends and Farms, LFFC, Local Businesses, Locavore, Real Food, Winter Eat Local and tagged cooking, CSA, farms, Food, foodie, local businesses, Locavore, real food, value of CSA. Bookmark the permalink. Seeing that sauerkraut makes me want to have a Reuben!